40, Boulevard D'alsace, 06400 Cannes, Frankreich. 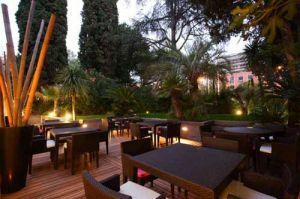 Entirely designed, Hotel Cezanne **** greets you in a leafy oasis of serenity, just a stone's throw from La croisette, the beaches, the Croisette, the Shops of the Rue d'Antibes and the harbor. 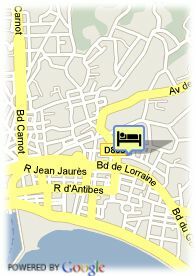 The hotel offers 28 rooms and Junior Suites with sound-proof and air-conditionning. They are fully equiped with mini bar, TV, internet ADSL, safe, bathrobesand hair dryer. The hotel also offers Fitness room, steam bath, Spa, garage, private beach, bar & room service open 24h a day. Bezahltes überdachter Parkplätze beim Hotel (15.00 €).